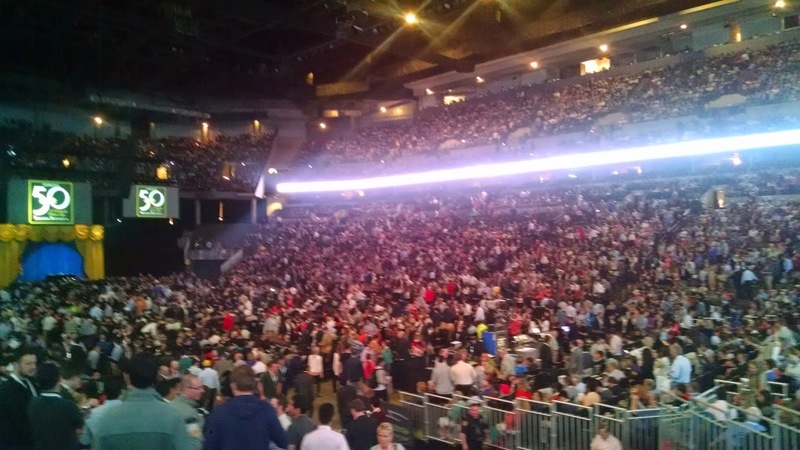 Going to Warren Buffett’s Shareholders’ meeting in Omaha, Nebraska to celebrate the 50 years of profitable Partnership of Berkshire Hathaway Inc was a life changing event for me. It opened my eyes to another world, a world that was magical, filled with wisdom. I had read many books about finance, but I avoided reading about Buffett. He is brilliant in making money — this is the only thing that I knew about him. Buffett, it turns out, has a big heart. In the meeting, people asked him inappropriate questions, as if he were superhuman: Can I have lunch with you? He answered the question as well as many questions with great humility and with simple short statements. Buffett cultivates a simple life full of simple instruction. He dazzled me by how simple he is: a great lesson! When Buffett asked people to invest with him in the early days, he made sure to have his money in the line as well. Buffett always said to his investors that If you lose money, I will lose money as well. He guaranteed 5% of return, and he will take 20% of all profits after that. Buffett had a vision when he was young that he would always be rich. He said “I have never had any self-doubt. I have never been discouraged.“ I am amazed by this self-confidence although he was young at that time – in his early twenties. Somehow Buffett ignored all the fear and self-doubt a normal mind would bring up and marched forward with so much confidence. Maybe Buffett was one of these people who seemingly are born mature, full of wisdom although he was young. In reality, some people grow faster due to extreme life challenges around them. Some become wiser than those around them because of the tremendous amount of motivation they have. Buffet was one of these people. He, always filled with motivation, predicted his wealth at an early age. Buffett selected people to work for him or around him very carefully “Always hang around people better than you and you will float up a little bit. Hang around with the other kind and you start sliding down the pole.“ Although I may have stated this idea in different words, I have believed in this message since I was a kid. If I sense pessimism in people around me, I immediately shift gears to avoid them in the future. I once worked with a person who was very pessimistic … very dark, not trusting anybody. It took me a while to discover this because this person was very smart and efficient as well as kind. I started to feel miserable and down every time I talked to him, thinking about all the wrong things in life. I finally had to avoid him. At the Shareholders’ meeting, Buffett repeated that 99.9% of his wealth will go to charity, spread over 20 years. Yesterday, June 5, 2015, was the end of a five-day auction to have lunch with Buffett in New York City. In order to bid for the E-bay auction, you needed to pay 25k in advance. All the proceeds go to the GLIDE foundation in San Francisco which feeds the hungry. Buffett describes GLIDE as “…maybe the most effective organization I have seen for people down on their luck. It takes people who have hit bottom and brings them back. 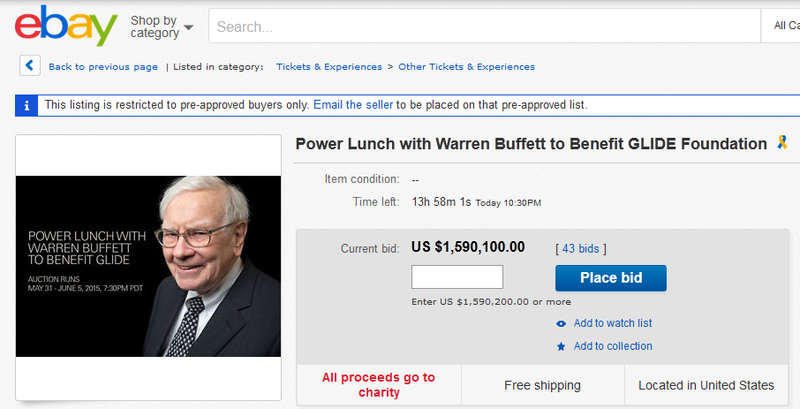 I have seen it with my own eyes.” It costs 2.3 million to have lunch with Buffett this year (2015). The winner this year was Chinese gaming company Da Lian Zeus Entertainment. This year‘s winner paid more than last year’s winner Singaporean businessman Andy Chua, who paid $2.2 million. The most expensive lunch with Buffett was in 2012 when an anonymous bidder paid $3.5 million. If you are the lucky winner of the bid, you can bring seven friends with you and you might eat in Smith & Wollensky steakhouse in NYC, owned by Alan Stillman who usually gives around $10,000 each year to GLIDE. This marathon of charity created by Buffett summarizes his philosophy in investment and in life. It is a great combination of intelligence, creativity, discipline, and altruism. Buffett changed the way I look at money, and I hope he changed a lot of people as well. What a legacy to leave behind!